Airbus A100, Fliegerfaust. Airbus might buy & upgrade CRJ line. What to think about this.. Fliegerfaust is usually well informed on BBD. Airbus would be acquiring for free the CRJ program in whole or in part according to what I was told. Really? Airbus commitments would be to further push the sales and including the CRJ in their product line-up renaming the CRJ as the A100. The 3 CRJ currently being made by Bombardier would be renamed A100-700, A100-900 and A100-1000 replacing the CRJ-700, CRJ-900 and CRJ-1000. Do you believe this? Take it or leave it, that's what I was told. Leave your comments at the bottom or the Fliegerfaust Facebook page. Airbus would move out its production from the current factory in Mirabel to make 100% of the space available to the A220 assembly. What's in for Bombardier? First, it would mark the completion of the strategic plan of totally leaving the Commercial Aircraft business, CSeries gone, Q400 gone, CRJ gone. The wings of the CRJ are already made at the assembly plan. Bombardier is the maker of the aircraft cockpit at Ville St-Laurent/Montreal. Airbus could also implement enhancements to the CRJ (then A100) by upgrading its engine providing better operating cost for its owners. Maybe GTF engines? Even the CRJ 1000 is 30% lighter than the A220-100. Not sure if this is a good idea or would become a loss making distraction..
Re: Airbus A100, Fliegerfaust. Airbus might buy & upgrade CRJ line. First of all, Sylvain Faust is only well informed when it comes to C series production. Everything else he says can be taken with huge grains of salt and is often times wrong more than right (basically every airline on earth has been on the verge of ordering the C series if we believe him until they mysteriously drop out and are never talked about again). Second I don’t see why BBD would give the CRJ away for free. Especially since they still build and sell the related Challenger 350/650. First, it would mark the completion of the strategic plan of totally leaving the Commercial Aircraft business, CSeries gone, Q400 gone, CRJ gone. Bombardier invested a lot & wasn't very succesfull in aviation lately. Maybe the investors, family, risk sharing governments moved into https://en.wikipedia.org/wiki/Realpolitik mode now. You can get out of the business by also selling the program. I would think BBD would try that first before just giving it to someone for free. ??? I wasn’t aware of this. Didn’t they just get some fresh orders for the Q400? God, I hope not. It's the worst jet to fly on from a passenger perspective. I doubt there is a business case. "For free" like the CSeries. Nothing is for free. - investment ahead to make it a success. Taking a lot of risk. That's why it seldom happens. More often competitors prefer to let a company go belly up first & than cherry pick what/ who they like. Get out of commercial aviation? The Q400 is still around. Clearly Airbus would not be permitted to buy that. The -200 is for sure the worst commercial aircraft in widespread service today, but I've never had an issue with the -700 or -900, which feel very similar to the E-Jets IMO. Not great, but not uncomfortable either. Just average. Q400 has lost against ATR -600s. Apparently airlines have no need for speed. SpiceJet placed a "big" order out of nowhere last year, that was re-celebrated on Farnborough. Q400 is what it is, an aftermarket project. It would just mark the end of the Q400 which is not surprising I also predicted BBD will drop out the commercial market and stick the the business jets so this deal if true is not a shock. Agreed, the -200s are uncomfortable with the low windows and cramped and outdated cabins. The Newer -700s and 900Nextgens i think are actually quite nice, ive had some comfy flights on both. The main cabin door is a little weired and they are lower to the ground, but i am all for he CRJ products as they are a rare T-Tail rear mounted engine aircraft. I hope more are sold. The CRJ700/900 should have normally survived as is for some time. If scope clauses remain as is (likely), its only present/future competitor still remain the E175E1. Other models are too heavy. Now, if Boeing actually acquires Embraer, then there's is big potential for supplier's/components cost decreases, which then would also translate into selling the E175E1 for less. 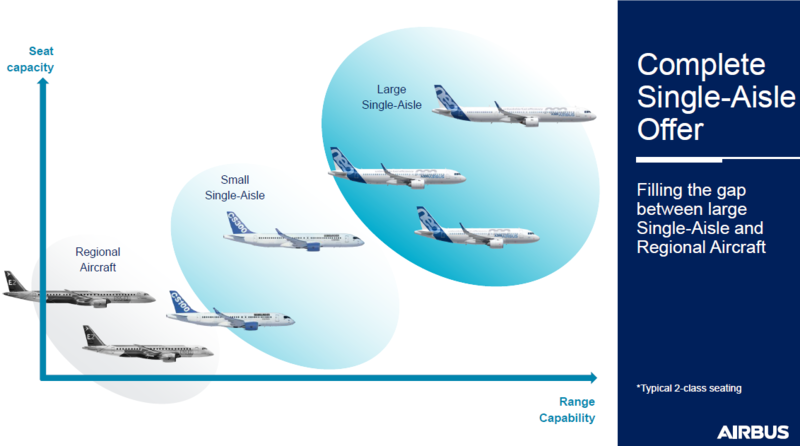 That's where an A100 now makes sense, benefitting from Airbus's supply chain..
Really because I know of a few airlines rather close to home that find the extra speed useful and find the plane iteself more useful than the ATR. In fact there are rumors for more orders floating around here and there. The ATR may be more attractive to the masses in places where they don’t need the speed, performance, or capability in icing, but there are places where the Q400 does win, that is if the operator has set up a max program that can get them to run reliably. There was some talk a few years ago about upgrading the 200, new engines, wings, etc. Still must be a need for a 50 seat RJ for small markets. As for as comfort, I'll take a 200 over an E-145, now that's a cramped cabin. I think the CRJ 200 are out of production, it's about the 700, 900 and -1000 I guess. A while ago BBD said they thought new engines might not be a good idea. Not sure if they would have done it if it was a good idea, they didn't haave the resources/ cash..
Often something is a bad idea until it is a good idea..
As for as comfort, I'll take a 200 over an E-145, now that's a cramped cabin. The Embraer 145 is one of my favourite aircraft. I felt privileged every time I travelled aboard one. I love the A-seats; you get a window seat and an aisle seat at the same time. The windows are big and located at the perfect place in the cabin. Surely the -1000 will be eating into Cseries. Although a re-engined upgrades CRJ700/705 would surely be a winner for the US regionals providing the scope clauses wouldnt change? The window positioning can't be overstated. The way the windows connect to the cabin makes such a huge difference in airliners. Its also why I love the 787. The ERJ has the best windows of any commercial airplane save the 787. They're gigantic! The CRJ windows are what make that plane feel so terrible. I think the CRJ-1000 maxes out at 100 seats and A220-100 has 25% higher seat capacity. Limted overlap. New engines would be GE Passport that replaced CF34 on the Global Business jets. But otherwise, knowing how "well" CRJ1000 sold, I just don't see how there would be any overlap. CRJ is simply not optimized for such a long fuseluge. Hope not. The CRJ's are awful from a passengers perspective. Hate those things. There’s still the problem of balance re-engining CRJ700/900 to the Passport. The Passport came in heavy and required some “adjustments” on the Global 7500. It’s also poorly placed for commuter jet work as its optimized for long, high-altitude cruise segments. While there is an intent to offer a high bypass passport, it is such a major weight balance issue that there will be no CRJ-200NEO. 700, or a new 750... That would be the model. A 900 would follow. I'm not sure there is enough MTOW to enable a -1000 re-engine (too little fuel capacity after adding the new engine weight). I wouldn't rule out the PW1200 for time to market, but I believe GE has the advantage (better core for the mission). If Hawaiian bought them they could call them "Hawaii 5-0s"
I find the 145 vastly superior to the -200. The windows are huge and actually placed correctly at eye level, and on the left side of the cabin you can get both a window and an aisle. The -200s cabin may technically be larger but the windows and A side seats make the 145 feel much more roomy IMO. I thought Airbus only bought the CSeries, not the entirety of BBD’s commercial line. That’s correct, it’s speculation at this point that Airbus will buy or be handed the remainder of BBD Commercial Aviation. Agree, Embraer 145s are awesome to ride in. First, the CF-34 was never installed on Globals, just the Challenger 601, 604, 605 and 650. The Globals ha e RR BR710 engines, soon to replaced with RR Pearls. The Passport exceeded its original designed weight causing some late redesign in the G7500. Second, the Passport, and the newer high compression engines are much heavier than the CF-34 causing balance issues. Engineering a fix will add weight, in addition to the engine weight, making the TOGW likely exceed the 86,000 pound scope limit OR, as Lightsaber stated, restrict range to be uneconomic in the US, anyway. Maybe Airbus getting it for “free” involves a royalty arrangement. Airbus takes over in exchange for having a license to use the designs and patents. Seriously, its collusion. A and B have done this on purpose with Bombardier and Embrear to have a duopoly. Are they both built on the same location? I thought yes (in Mirabel) but now I see that the Challengers are built in Dorval. Why is that? Aren't they supposed to have the same cross section and thus be built on the same line (like the 737 and 757 back in the time)? I don't see much value in the CR9 and CRK. A clean-sheet design is needed; that is a 40-year old design stretched multiple times from the first Challenger that entered service in 1978. This is attempting to compete with the much newer E-Jet design. Two different lines, two different planes. The 350 is unrelated to the 600-series planes. The 300 was designed in KICT by Learjet for production in KICT. Production moved to Montreal after about LN 20-030. The 600 line was originally at Cartierville, but moved to Dorval. When the CRJ sales took off, Dorval couldn’t provide enough space, so moved to Mirabel where, no doubt, the QC government gave them an excellent deal on land. The CRJ 900 is still pretty efficient on fuel burns, meets the US market requirements and is sufficiently cheap to buy and operate. There’s nothing new that would make the business case to invest in a new design. If BBD really wants to offload the CRJ, would the Chinese be interested in it? Perhaps Airbus would want to prevent that kind of thing from happening. The CRJ900 and CRJ1000 (a 20 year old design) pretty much competes with the E175-E2 (and Q400 by seating) and E-190-E2, a much newer design? A few years ago I had booked flights on the Estonian Air CRJ900. I was really looking forward to fly on this good looking aircraft. Once inside I found out all the windows were misaligned. That took away the fun of flying it. Should have named it A700, A900 and A1000 instead. Sounds more modern and less complicated to market. Purely in the realms of speculation, but I have long suspected that the CSeries deal was only the thin edge of the wedge for BBD and Airbus. The way I see it, the Beaudoins are probably looking for a long-term exit path from commercial aviation and Airbus is looking to expand its product offering. I've thought that could see Airbus take over the remaining commercial programs at BBD, and sell its half-share in ATR to Leonardo. If - and it's a big IF - there is anything to this report, perhaps that could all eventuate. I don't see why Airbus would look to sell its ATR share, ATRs are commercialy successful. And if Airbus buy all the Bombardier commercial offer like speculated, the Q400 would be out, leaving ATR almost alone on its market. There is too much work to do to organize A220 ramp-up in the next years, i can't see Airbus fighting on another front in Canada (even if it's a small one). Simple reason - they do not want to invest any further in ATR to build a larger tubroprop. Leonardo, or Finmeccanica as it was, has been keen for ATR to push ahead with a 100 seat turboprop based on a modular design that could also be the basis for a military transport. Airbus has been dithering on it, likely because any new design is going to have to be radically different to the ATR 72 to be certificated under today's rules. Add to that, the Airbus Group overall seems to be favouring a move towards electric propulsion for regional aircraft, so I think the current ATR shareholder set-up has a limited life. Plot twist: BBD sells the Q line to Embraer who gets bought out by/collaborates extensively with Boeing.